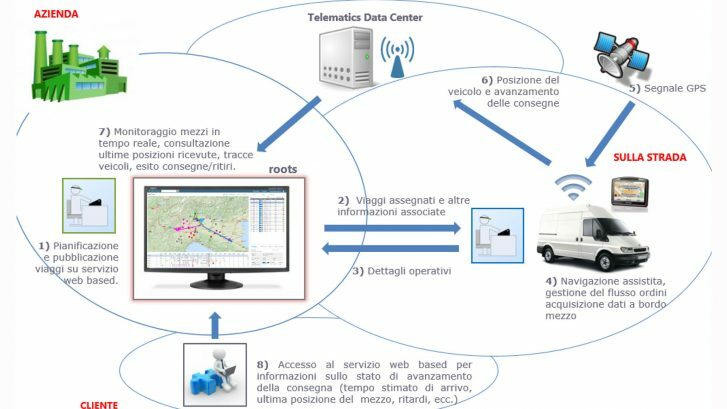 roots is a web-based cartography system used to resolve logistics and workforce management questions, taking account of the specific conditions of each company and its customers. It plans work by optimising travel, increasing the efficiency of available resources and balancing assigned workloads. roots is a multi-user, multi-company web system for information sharing and access from any workstation, fixed or mobile. The system’s cloud structure enables interaction with the systems and services of clients, telematic platforms, transport providers. In roots, planning is interactive and may be automatic or manual. In both cases, the system checks that all operating conditions are met (delivery times, quantities to be delivered/picked up, capacity and typology of vehicles being used, required technical skills, driving and work schedules, breaks and stops). roots monitors travel plan execution, with real-time checks on vehicle positions, delivery progress, compliance with agreed service levels. The roots dashboard provides immediate reports for timely control of all operations.